I have been a long time HTC smartphone owner. I recently switched from the HTC One M8 to the HTC One M9. The problem with upgrading is that you have to upgrade many of the accessories as well, including the phone cases. The case I was saddest to leave behind was my dot view case. You see the dot view case provides more than a cool look for my phone. It also provides functionality like no other case on the market. The “ice” part of the case is in reference to the clear back of the dot view case. 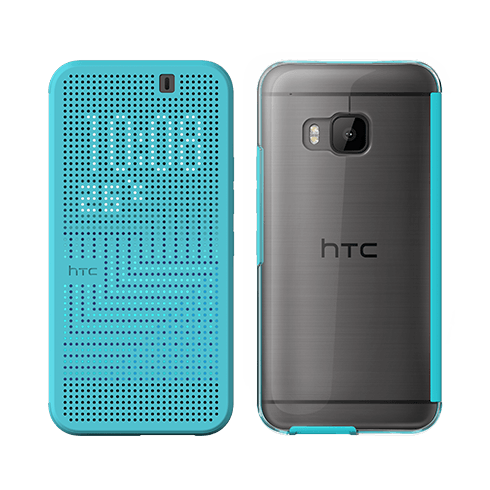 This is a huge improvement over the original design because I loved the functionality of the case but hated that it covered the beautiful all metal design of my HTC One M8. That is not longer a problem. My M9 now gets to show off the great build quality of the phone while giving me the great functionality of the front cover. That’s a win-win for me. The original dot view cover did a decent job of covering the front and back of the phone but it was extremely easy to separate from the phone. It led many to believe that it would easily separate from the device if dropped. The Dot View Ice Case Is nearly impossible to separate from your phone once it is in place. This provides much more security in the case of a drop. The cover lays much more flush with the screen of the phone as well. In general, it is a much better experience than the original dot view. The front flap itself fits better and at the same time is easier to prop open than the original. How HTC did that, I’m still unsure. One of the biggest complaints about the original case was the limited amount of notifications you could receive through the cover. HTC converted that from a weakness to a strength. I can select notifications from nearly every app I have installed. They come through consistently all day long. HTC allows for tons of customization of the screen saver, including live wallpapers and holiday themes. Dot Message allows you to create scrolling messages that display through the front cover. They’re fun to use when sending a message from across the room or cheering on your favorite team. Then there’s Dot Breaker, HTC’s version of Pong. It is a simple brick breaker game, but it’s a great time killer and display of the increased functionality of the HTC Dot View Ice Case for the HTC One M9. The Dot View Ice Cover is an impressive accessory for the HTC One M9. So much so many people ask if it is available for their non HTC device. I have to inform them that it is an HTC exclusive. Not only does it look great but it protects the front and back of your HTC One M9 at the same time.